Israeli forces raided the Palestinian village of Bardala, in the northern area of the Jordan Valley, and destroyed 400 meters of water pipelines, which Israel claims are illegal, on Thursday. 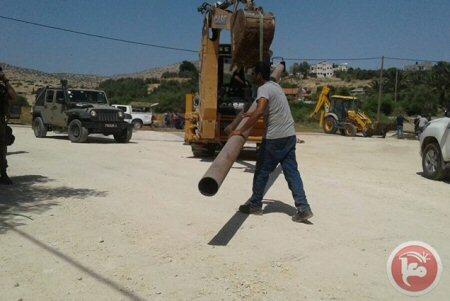 According to Dirar Sawafta, a member of the Bardala village council, Israeli forces stormed the village, razed and dug several holes in one of the water lines in search of water holes. Israeli forces destroyed more than 400 meters of water pipelines, which is an important life source to many Palestinians residents of the valley, who are mainly farmers or Bedouins, and mostly living in enclaves closed off by Israeli military zones, checkpoints, and more than 30 illegal Israeli settlements. Sawafta added, according to Ma’an, that Israeli forces destroyed the water pipelines under the pretext that they are illegal. Recently, Israeli bulldozers and forces have razed the area, in search of water holes, and destroyed several water sources in the village and several other areas in the Jordan Valley. The Jordan Valley and Dead Sea area holds nearly one-third of the West Bank’s land and is home to roughly 60,000 Palestinians. “Area A” is under full PA control and “Area B” is under Israeli military control; in this area the PA is in charge of civilian affairs. This has effectively divided the West Bank into three main non-contiguous areas. The Colonization and Wall Resistance Commission said on Thursday its attorneys won an Israeli High Court’s decision postponing the demolition of Khan al-Ahmar community, east of Occupied Jerusalem, to August 15. Last week, Israeli forces declared the community a closed military zone and blocked journalists and diplomats from entering the area. Bulldozers with military escorts rumbled in and began leveling the ground. 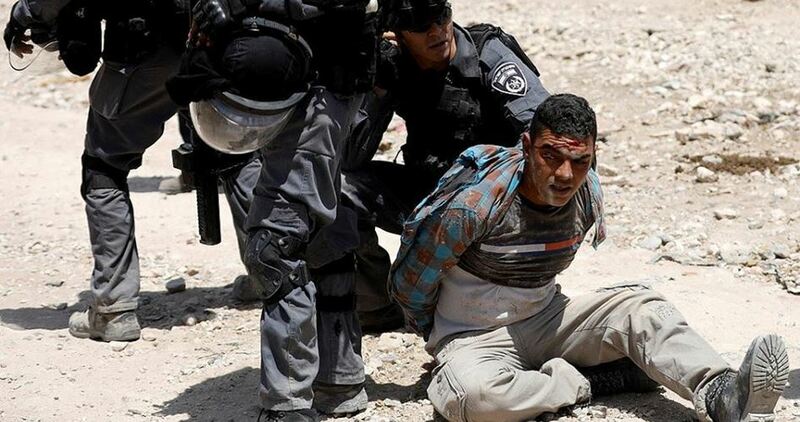 About 35 Palestinians from the Bedouin community were reportedly injured by Israeli forces when the latter assaulted them as they were preparing for the demolition. Khan al-Ahmar is one of several communities in the West Bank under threat. Since its people arrived decades ago as refugees after being displaced by Israel from the Negev, Israeli settlements built on the occupied land have grown up on the surrounding hilltops. 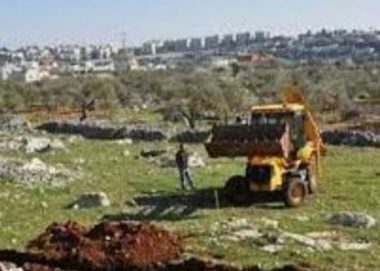 Israeli soldiers started, Thursday, bulldozing Palestinian agricultural lands in Bardala village, in the West Bank’s Northern Plains. He added that the soldiers frequently dug around the main line, under the same allegations. Water shortages are one of the most issues the Palestinians face is the occupied West Bank, not only the Northern Plains of the West Bank, but in many parts of the territory, an issue which severely devastates agriculture, and the livelihoods on hundreds of families. In Summer, the Palestinians go for several weeks at a time without running water, and in numerous cases, the army demolishes Palestinian water wells, while the illegal colonialist settlers suffer from water shortages, or interruptions, for their homes, colonies’ lands and swimming pools. The Israeli occupation army’s civil administration intends to flout injunctions recently issued by the high court of justice against the evacuation of the Bedouin community of Khan al-Ahmar in east Jerusalem and demolish the hamlet in the next few days. Last week, the Israeli high court of justice has accepted a Palestinian petition and issued an injunction ordering a temporary halt to the demolition of the Bedouin Khan al-Ahmar hamlet for a few days. 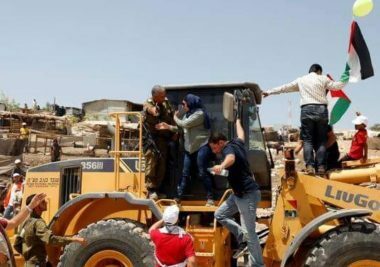 Although there is a new petition filed last Monday with the same court, the Israeli army’s civil administration on Tuesday informed the court that it intends to demolish the village in another few days and relocate the villagers to a site near the Abu Dis dump. The court issued its temporary injunction on the demolition in response to the earlier petition, but the civil administration persisted in building new roads in the area to facilitate the arrival of troops to carry out the forced evacuation of the local residents. On Monday, the high court issued a restraining order in response to the new petition. The order bars the civil administration from evicting the residents and requires it to respond to the petition’s arguments by July 16. In its response on Tuesday to the first petition, which was filed last week, the civil administration blatantly asked the court to issue a ruling quickly, since “forces are already deployed in the field” to carry out the demolition. Last week’s petition argued that residents had submitted a detailed master plan to the civil administration earlier that week, but the administration had refused to consider it. One of the civil administration’s arguments for why this petition should be rejected was that it did not include any documents demonstrating any rights to the land covered by the master plan. Therefore, it said, its refusal to consider the plan was justified. In a response to these Israeli arguments, another Palestinian petition was filed on Monday. The petition states that Khan al-Ahmar residents received permission from the land’s legal owners to use it. 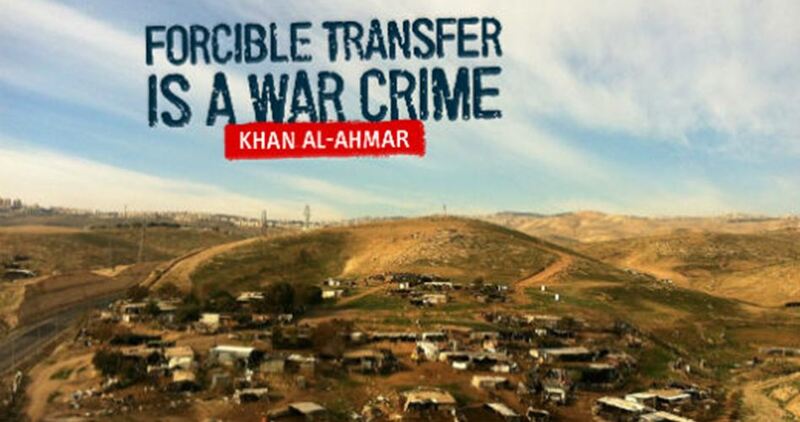 According to the new petition, Israel has wrongly claimed for many years that the Bedouin village of Khan al-Ahmar sits on state land, and that is what enabled it to persuade the high court of justice not to intervene in its decision to raze the hamlet. The new petition also affirms that this is privately-owned land legally registered in the Jordanian land registry back when Jordan controlled the West Bank. The Israeli occupation authorities on Wednesday seized a makeshift home in Shu’fat town, north of Occupied Jerusalem. The container’s owners said they obtained an order to stop the confiscation and the demolition threats. However, the occupation authorities paid no heed. In June, Israeli bulldozers demolished 15 residential and commercial structures in Occupied Jerusalem. Three Palestinians were forced to self-demolish their homes. 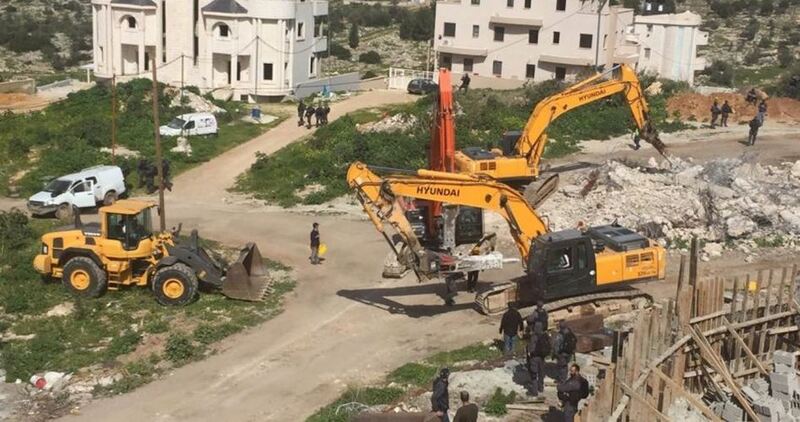 Israeli bulldozers are set to demolish a number of Palestinian houses and a car shop in Shu'fat town north of Occupied Jerusalem. The PIC reporter said that a large police force stormed the town in the early morning hours accompanied by Jerusalem Municipality crews who took measurements of houses owned by al-Ashhab, Maswada and Abu Khdeir families in preparation for their demolition. He noted that the targeted area was previously announced a "green area" by the Israeli-controlled Jerusalem Municipality who distributed demolition orders against 13 Palestinian houses there. Although 4 Israeli settlements and a new road were later established in the area, demolition orders against Palestinian houses did not stop. The Palestinian cabinet approved, on Wednesday, a recommendation by the Minister of Local Government to turn Khan al-Ahmar community, near Jerusalem, into a village council. Khan al-Ahmar is under threat, by Israel, of demolition and displacement of its Bedouin community, in order to build a Jewish settlement on the location. The cabinet said, in a statement, after its weekly meeting held in Ramallah, that a local authority will be established and will be called Khan al-Ahmar village, which will have an appointed council of members that will run its daily affairs and demarcate its boundaries. 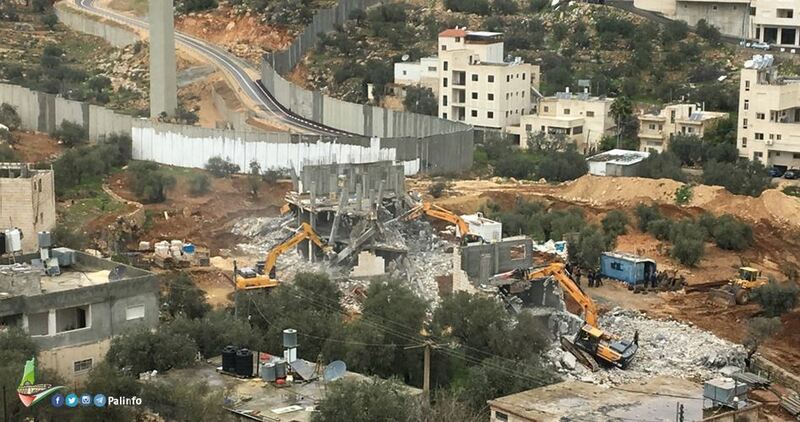 According to WAFA, the decision was made to support efforts by the community to remain on its land in light of Israeli threats to demolish the community and displace its residents. Dozens of Israeli soldiers completely sealed and isolated, Wednesday, al-Khan al-Ahmar Palestinian Bedouin community, which is slated for demolition and displacement, and placed concrete blocks at its entrances. The head of the National Committee against the Annexation Wall and Colonies, Walid Assaf, said the soldiers prevented dozens of Palestinians and international peace activists, from entering the area, to continue the protests against the demolitions and displacement. He added that the soldiers isolated al-Khan al-Ahmar, and prevented many foreign dignitaries and consuls from reaching the area, while a few others managed to enter. Assaf also stated that many physicians tried to enter al-Khan al-Ahmar, but were denied entry. He said that the Palestinian Medical Relief Society brought a mobile clinic, to provide services for the villages, but the army prevented its entry. The Medical Relief has been providing basic services to the villages of al-Khan al-Ahmar, especially the children and people who suffer from chronic conditions, such as diabetes, heart diseases and high blood pressure. In addition, the soldiers surrounded the local school of al-Khan al-Ahmar, as it is also under the threat of demolition, just as the rest of the Bedouin community. The school was funded by the European Union, while the soldiers also held several peace activists in it. The villagers of Khan al-Ahmar hold deeds to their ancestral land where they reside, but the Israeli government refuses to recognize them because they were issued by the Palestinian Authority, and the land where the Bedouins live is part of a planned expansion of illegal colonies. The entire village is set to be razed to the ground by military forces under the ‘E1 Jerusalem Plan’ meant to encircle the eastern part of Jerusalem with Israeli colonial settlements in order to encircle Jerusalem and claim it for Israel, denying the Palestinian people’s historical and ongoing claim to the city. The plan, which began in 2005 and has vastly expanded Israeli colonial settlements on Palestinian lands, is set to displace hundreds of thousands of Palestinian residents from their homes and add them to the Palestinian refugee population – the largest refugee population in the world. Last Thursday, the Israeli High Court ruled to temporarily halt the demolition, for six days, following an international media campaign and pressure from foreign diplomats, as well as non-violent passive resistance by Palestinian residents of Khan al-Ahmar, and peace activists. 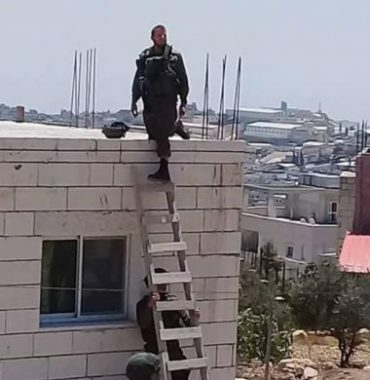 Israeli soldiers invaded, Wednesday, the al-Khader town, south of the West Bank city of Bethlehem, and occupied an under-construction home before turning his rooftop into a monitoring post. Ahmad Salah, the coordinator of the Popular Committee against the Annexation Wall and Colonies in al-Khader, said the soldiers invaded Abu Sood area, west of the town, before storming the home of Yousef Abed Mousa. Salah added that the property is still under-construction, and that the soldiers occupied its rooftop. 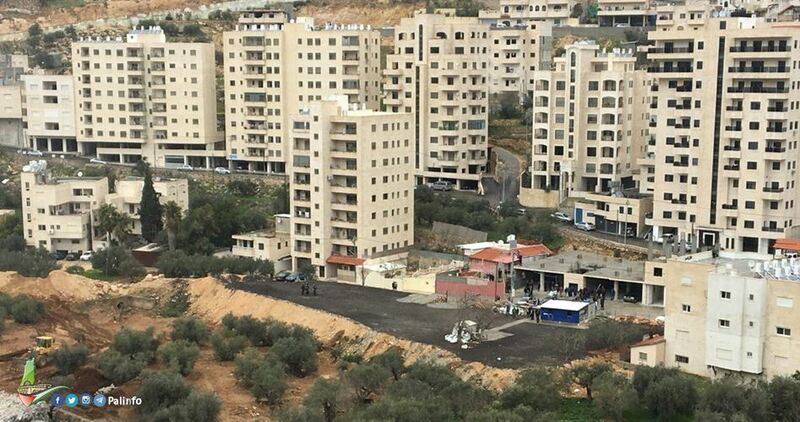 He also stated that the army previously issued an order, halting the construction of the property, and is threatening to demolish it for being built without a permit from the Israeli authorities. The Palestinian Prisoners’ Society (PPS) has reported that Israeli soldiers invaded several communities in the occupied West Bank, before breaking into and violently searching dozens of homes, and abducted nineteen Palestinians in addition to illegally confiscating cash, a mobile phone and a laptop from one of the homes. 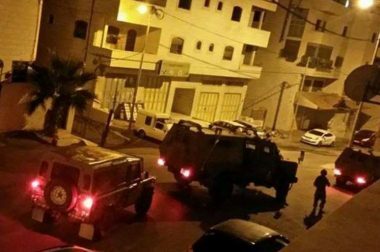 The PPS office in Tulkarem, in northern West Bank, said dozens of soldiers invaded Deir al-Ghosoun town, north of the city, before many soldiers stormed the home of Ameed Badran, 20, abducted him and illegally confiscating a laptop, a mobile phone, and 250 Shekels. The soldiers also summoned Ameed’s mother for interrogation, and fired live rounds in the air near the property before withdrawing. It is worth mentioning that the army, and security officers, claimed they found weapons, and confiscated cash, in Deir al-Ghosoun, and in Qotna town, northeast of occupied Jerusalem. In addition, the soldiers invaded and ransacked the home of Yasser Salim, in Azzoun town, east of the northern West Bank city of Qalqilia, and abducted his son, Aseed, after assaulting him, causing cuts and bruises. In Ramallah, in central West Bank, the soldiers abducted Sobhi Abu Shousha, from his home in Betunia town, west of the city, and fired live rounds, gas bombs and rubber-coated steel bullets, at protesters who hurled stones at the invading army jeeps. In addition, several Palestinians suffered the effects of teargas inhalation in Beit Ummar, north of Hebron, during protests against the army’s invasion of the town, the violent searches of homes, and the soldiers’ abduction of nine Palestinians. Raed Sharif Abu Mariya, Beit Ummar – Heron. Ayham Khalil Sabarna, Beit Ummar – Hebron. Khalil Jamal Abu Mariya, Beit Ummar – Hebron. Ammar Jamal Abu Mariya, Beit Ummar – Hebron. Eyad Omar Sleibi, Beit Ummar – Hebron. Ziad, Beit Ummar – Hebron. Hasan Mohammad Miqbil, Beit Ummar – Hebron. Jihad Raed Miqbil, Beit Ummar – Hebron. Ahmad Samir Abu Ayyash, Beit Ummar – Hebron. Ghassan Thouqan, (University Teacher) Nablus. Ibrahim al-‘Amer, (Lawyer) Kafr Qalil – Nablus. Yazan Mohammad Walid, Qusra – Nablus. Ahmad Abdullah Abu Sirriya, Nablus. Aseed Yasser Salim, Azzoun – Qalqilia. Sobhi Mohammad Shousha, Betunia – Ramallah. Jawad Mahmoud Taqatqa, Beit Fajjar – Bethlehem. Shaher Issa Taqatqa, Beit Fajjar – Bethlehem. 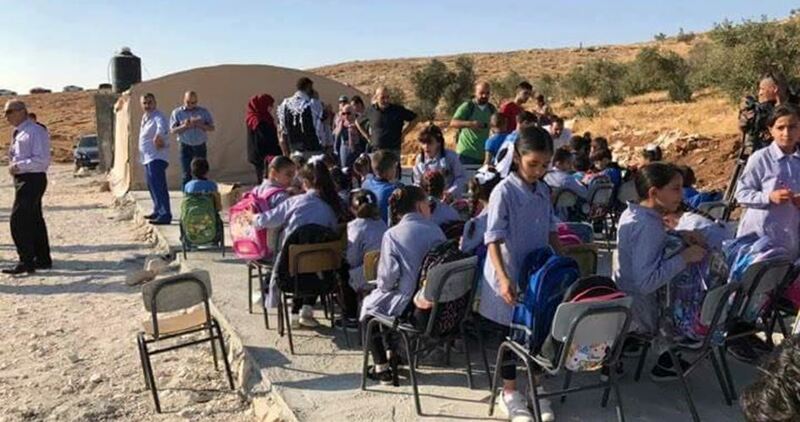 The Israeli army raided, on Tuesday, a school in the village of Khillat al-Dabe, in Masafer Yatta, southern occupied West Bank, and informed the head of the Twanneh village council, Muhammad Ribee, that it will be removed. Ribee told WAFA that the soldiers also informed a local resident that the three rooms he uses as shelter for his family will also be demolished, under the pretext they were built without permit. The school was built of mobile homes to accommodate students from the area. 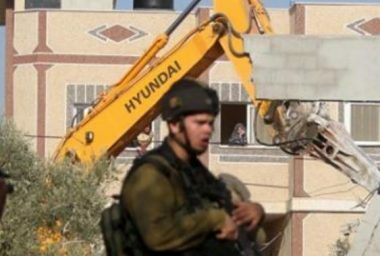 Israel does not allow Palestinian construction in Masafer Yatta, under the pretext the area is under full Israeli military rule and any construction should be first approved by the military government, which rarely, if ever, grants permission to Palestinians, anyway.